Can Alcohol Cause Memory Loss? There's nothing wrong with enjoying the occasional glass of wine, shot of whiskey, or pint of beer. For many people, alcohol is a big part of social culture, there to bring relaxation and be enjoyed. But, it's no secret that when alcohol is handled irresponsibly, there can be serious consequences. Along with the physical repercussions of alcohol abuse, such as liver damage and blood poisoning, memory can also become impaired. 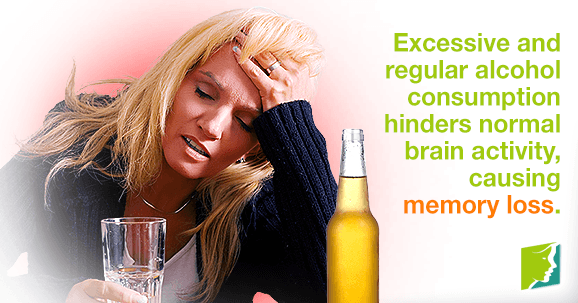 Binge drinking, hangovers, and long-term heavy drinking can trigger or exacerbate both long- and short-term memory loss. Binge drinking is the consumption of an excessive amount of alcohol in a short amount of time, and short-term memory loss known as a blackout is a common consequence of this. Once sober, a person who blacked out may not be able to recall details or entire events experienced while intoxicated. This can be dangerous for a number of reasons, not least because intoxication increases the likelihood of being taken advantage of, involvement in violence, and driving while under the influence. Studies have shown that blackouts occur primarily when spirits (e.g., rum, vodka, and whiskey) are consumed. After drinking, the body produces extra insulin to help metabolize alcohol by counteracting increased blood sugar levels. This process usually lasts into the next day; insulin continues to remove sugar from the blood, causing a feeling of lethargy or tiredness that contributes to a hangover. Lethargy impairs concentration, meaning that with a hangover, a person is less likely to absorb information properly in the first place, making it difficult to recall it at a later date. Alcohol can lead to an increase in body temperature and dehydration. Dehydration is maximized as body fluids are lost through sweating and urination as the body attempts to expel alcohol molecules. Dehydration hinders attention span and concentration, making memory issues more likely. It also prevents the body from getting restful sleep after alcohol consumption; even if the drinker has achieved the recommended seven to eight hours of rest, it is unlikely to have been fulfilling, and they will probably still experience lethargy and concentration issues the following day. Heavy drinkers or alcoholics are likely to notice problems with long- and short-term memory. Regularly consuming alcohol in excess disrupts activity in the hippocampus and frontal lobes, which are parts of the brain responsible for the formation of memories. Another common symptom of alcohol abuse is a thiamine (vitamin B1) deficiency, brought about by poor nutrition. Not only does a thiamine deficiency impair short-term memory, but in severe cases, it can also lead to Wernicke-Korsakoff syndrome, which is a memory-affecting and potentially fatal brain disorder. To answer the original question - can alcohol cause memory loss? - the simple answer is that yes, when consumed irresponsibly, it can. Try to avoid drinking heavily on a regular basis or binge drinking on special occasions. Limit your alcohol intake to around three units a day – which equates to approximately one glass of 12%-proof wine or just over one pint of 4%-proof beer – to enjoy alcohol and its effects without it impeding your memory. Do you find that you have been forgetting simple things, and finding it difficult to recall new information? You may find be suffering from memory lapses.